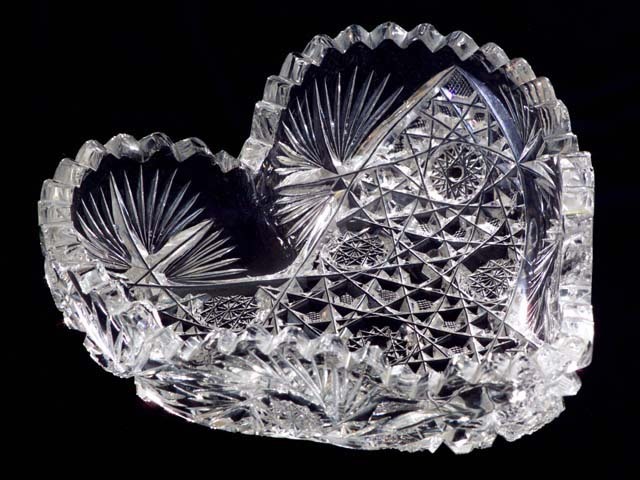 Intricately cut clear crystal heart shaped candy dish having a clear ring when lightly tapped. This bowl is 5 7/8" x 5 3/4" x 1 15/16" tall x 5/16" thick with serrated lip. The sides have Brunswick 12 pt. stars centered pinwheels and 13 point fans. Each heart lobe has 20 point fan and a 12 pt. hobstar. The point of the heart has a 16 pt. hobstar.